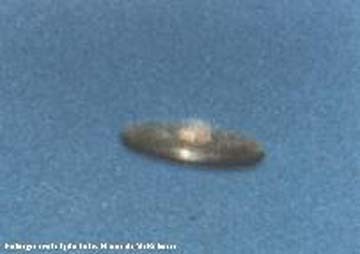 This is the complete report on the UFO sighting by the Japanese crew of a jumbo freighter aircraft in November, 1986. 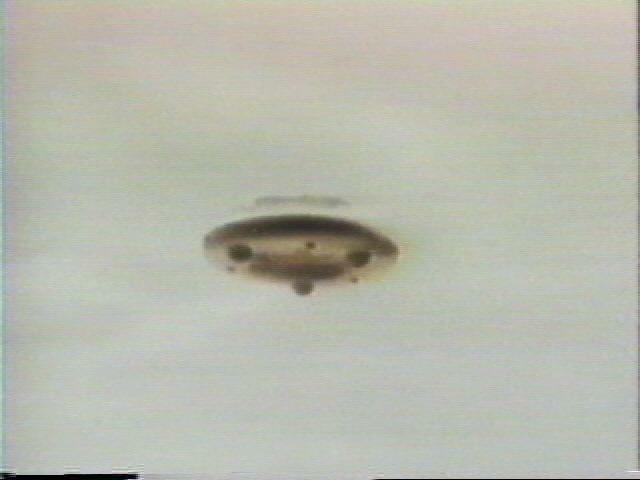 This sighting gained international attention when the Federal Aviation Administration (FAA) announced that it was going to officially investigate this sighting because the Air Route Traffic Control Center in Anchorage, Alaska, had reported that the UFO had been detected on radar. Captain Terauchi was featured on numerous radio and TV programs and in People Magazine. Within a few months of these events he was grounded, apparently for his indiscretion of reporting a UFO, even though he was a senior captain with an excellent flying record. In mid-October, 1986, Capt. Kenju Terauchi was excited to learn of a special Japan Airlines flight from Paris to Anchorage and then to Tokyo. 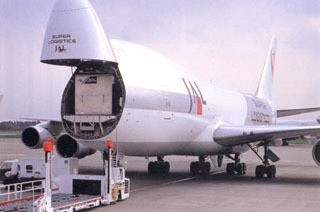 It was to carry a cargo of French wine. There would be an intermediate stop at Reykjavik, Ideland. 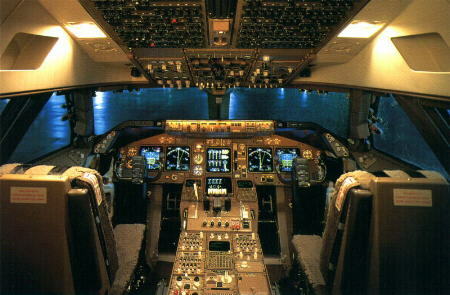 The flight began on November 16, 1986, with himself and a crew of two (copilot, flight engineer) in the cockpit. The plane landed in Iceland and waited for good weather. The next day the plane took off heading north northwest. A bright moon helped with the visibility for the night flight over Greenland, but as the plane continued over northern Canada the moon set behind them. When the plane reached an air route reporting point in far northwestern Canada called “Shingle Point” the sky ahead was dark except for an afterglow of sun in the west. The plane reported its position to the flight control center at Edmonton, Alberta, and continued across the Canada-Alaska border, where it made history. UFO history, that is. Although this wasn’t a routine flight, it wasn’t supposed to be a newsworthy event. But something happened over Alaska which caught the attention of the world for several days in late December and early January, 1987. Virtually every newspaper in the world carried a story about what Capt. Terauchi and his crew saw over Alaska. This is the story of that sighting as told to the Federal Aviation Administration (FAA) by the crew members and the flight controllers on the ground. It was about 11 minutes past 5 local time, the late afternoon of November 17, while JAL1628 (the designation for this particular flight) was high over the frozen northeastern part of Alaska that Capt. Terauchi first realized that he had company: there were lights of some crafts to the left and below. After watching them for a short time he decided they were the lights of “special missioned aircrafts of two fighters” on some mission. (Note: Alaska air space, being close to the then Soviet Union, was patrolled by USAF jets.) He decided to ignore them. But then he realized that after several minutes they had not changed their apparent position relative to his aircraft. In other words, they were flying along with him [1,2]. 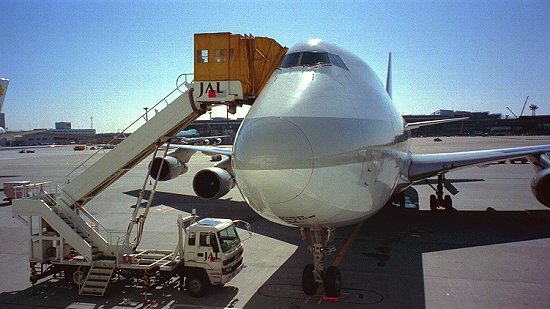 At that time the Boeing 747 freighter was operating on autopilot and heading southwestward (a heading of about 215 degrees) at an altitude of 35,000 ft . The sky to the right had an afterglow of sunset, but ahead and to the left it was very dark. The Anchorage Air Route Traffic Control Center (AARTCC) had called the plane just about two minutes before this time, i.e., at 5:09:20 [4,5] (or 20 sec. past 5:09 PM; exact times are based on the AARTCC tape recorded record of the events) to report the initial radar contact with the plane, which at that time was about 90 nautical miles (nm) notheast of Fort Yukon. (1 nm = 1.15 statute miles = 1.85 km) (Referring to a map, the plane at this time was at the “upper right hand corner” of Alaska.) The flight controller had asked the plane to head directly toward an air route reporting point called Talkeetna, named after the small Alaska town nearby (north of Anchorage and not far from Mt. McKinley) . 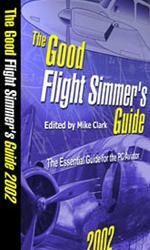 (In doing so the plane would pass south of Fort Yukon and Fairbanks. The copilot, who handled the aircraft communications, acknowled- ged the AARTCC request and then turned the plane to the left (“left rotation”) about 15 degrees to a heading of 215 degrees. It was during this turn that Capt. 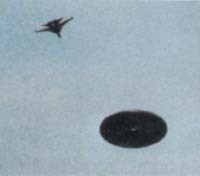 Terauchi, sitting on the left side of the cockpit, first saw the unidentifiable lights out his side window . After the plane levelled out he observed “lights that looked like aircraft lights, 30 degrees left front, 2,000 feet below us, moving exactly in the same direction and with the same speed we were.” At that time the airplane was flying at about 525 kts (nautical miles per hour) ground speed (972 km/hr or 605 mph) according to the tracking data . Subsequently the speed decreased to about 500 kts. It is important to note the pilot’s statement of his belief that the lights were 2,000 feet below him. He could not know how far below the lights were just from his visual sighting. (To deter-mine the distance below he would have to know the exact depression angle and the distance to the lights.) Nevertheless, his statement indicates that his sighting line to the lights had a noticeable depression angle (the angle below horizontal). The captain’s initial reaction to the lights was to ignore them as US air fighters, probably military aircraft from one of the nearby Air Force Bases (Eielson or Elmendorf). But the position of the lights “had not changed even after a few minutes and that called our attention” . The lights of these two “aircraft” stayed at the left for a while and then the unbelievable happened . The vertical lines represent boundaries enclosing a dark center of each object. The horizontal lines of circles represent flame colored or yellowish “exhausts” flaring outward, left and right,from the dark center. There are only four “sections” of flames shown here, but the captain’s sketch shows several more sections which made up one “craft.”. is based on the sketch made by the captain about two hours after the event  and again a month and a half after the event ). It was the captain’s impression that the two “aircrafts” he had seen for the first time to the left only minutes before had suddenly jumped in from of his plane. In his written testimony Terauchi speculated that the “spaceships” fired jets to “kill the inertia (actually momentum!) of their high speed maneuver.” After this maneuver from the left of the plane to the front, “the ships appeared as if they were stopped in one place in front of us.” At this time one “ship” was above the other. “Then three to seven seconds later a fire like from jet engines stopped and became a small circle of lights as they began to fly level flight at the same speed as we were, showing numerous numbers of exhaust pipes. However the center area of the ship(s) where below an engine might be was invisible. [From] the middle of the body of a ship sparked an occasionally (sic) stream of lights, like a charcoal fire, from right to left and from left to right. Its shape was square, flying 500 feet to 1,000 feet in front of us, very slightly higher in altitude than us. Its size was about the same size ad the body of a DC-8 jet, and with numerous exhaust pipes.” The pilot speculated that the “firing of the exhaust jets varied, perhaps to maintain balance. Some became stronger than others and some became weaker than others, but [they] seemed [to be] controlled automatically” . At the time of this startling appearance the pilot “did not feel threatened or in danger because the spaceship moved so suddenly. We probably would have felt more in danger and would have been prepared to escape if the spaceships were shaking or unable to stop themselves.” (Note that the plane was traveling nearly 10 miles every minute so there wouldn’t be much time to react if he felt he were going to run into something a short distance in front of his plane.) It was at this time that the pilot concluded that he was looking at something REALLY unusual because, in his words, “it is impossible for any man made machine to make a sudden appearance in front of a jumbo jet that is flying 910 km/hr and to move along in a formation paralleling our aircraft” . After this sudden appearance in front of the jet the lights moved in formation with the jet for three to five minutes. As they moved they rocked or swayed back and forth. Then they abruptly rearranged their orientation from one above the other to side-by-side. the captain’s drawings made shortly after the event and again two months later. He compared them to “output exhaust” like the “Challenger (as it took off)” . He described the colors as “amber and whitish.” He stated that the “numerous lights” were “exhausts on the engines” which were “lined up all the way.” When they were “blasting recoil [the] jets [were] so strong that I could not see [the individual lights and their arrangement] because it was so bright.” However, “once the recoil blasts stopped the speed was absolutely steady, not faster, not slower, and I could see them (the individual lights or exhaust ports) very clearly” . Besides the lights of the “exhaust ports” the captain also reported seeing “sparks like a fire when using gasoline or carbon fuel.” By this he may have meant brief bursts of yellowish color. The copilot, Takanori Tamefuji, compared the numerous lights or flames to “Christmas assorted” lights with a “salmon” color. (9) He said, “I remember red or orange, and white landing light, just like a landing light. And weak green, ah, blinking. ” The intensity wasn’t constant but rather it pulsated: “became stronger, became weaker., became stronger, became weaker, different from strobe lights” (which have very quick flashes). The lights were “swinging” in unison as if there were “very good formation flight…close (formation)” of two aircraft side by side. Upon seeing the lights he first thought he was seeing “two small aircraft.” But they were “very strange” because there were “too many lights” and “it was so luminous.” Subsequently he had the feeling that “it was larger than normal aircraft.” He thought that lights were “a little bit lower” than the altitude of the plane, while Capt. Terauchi recalled that the lights might have been a bit higher. Tamejfuji pointed out that “it is very difficult” to judge the altitude of “head-on traffic.” He summarized his impressions by saying., “I’m sure I saw something. It was clear enough to make me believe that there was an oncoming aircraft” . Of course, these “aircraft” were not oncoming. Instead, they were matching exactly the speed of the 747 jet. According to the captain’s drawing each of the two “aircrafts” had two rectangular arrays of lights or horizontal flame “exhausts” and these were separated by a narrow rectangular dark area. The copilot’s drawing was similar . The two arrays associated with a single craft were “swinging” or rocking to the left and right as if they were rigidly bound together and rotating back and forth about a central pivot point within the dark region . The flight engineer who sat behind the copilot, Yoshio Tsukuba, had a poorer view of the lights. He recalled that when he first saw them he was looking “through the L1 window at the 11 o’clock position” (about 30 degrees to the left of straight ahead) and he saw “clusters of lights undulating” . The clusters were “made of two parts…shaped like windows of an airplane” (i.e., arranged in square or rectangular clusters). Apparently having clusters of blinking, undulating and rotating (“swinging”) lights nearly in front of their plane and apparently only a few thousand or so feet away was too much for the crew. After discussing the situation over the next 60 seconds or so they decided to try to find out what was going on. Mr. Tamefuji, who was the “voice” of the aircraft, called the AARTCC. It was now about nine minutes since Capt. 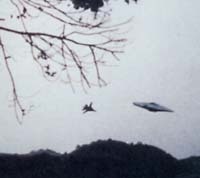 Terauchi had first noticed lights on “two aircrafts” at the left of his plane and it was probably only about a minute or two after the “spaceships” had abruptly appeared nearly in front of the jet where they could be seen by the whole crew. At the time of the call the two “ships” were still traveling one above the other. Here follow statements transcribed from the AARTCC audio tape that recorded the whole sighting. The times listed below are minutes and seconds of Alaska Standard Time . 5:19:28 JAL1628 – Do you have any traffic in front of us? It appears that Tamefuji’s reference to “seven” o’clock in the tape transcription is an error either by Mr. Tamefuji (who had to speak English to communicate with the AARTCC) or by the transcriber. The seven o’clock position is far to the left and nearly behind the airplane where Tamefuji couldn’t have seen the lights. It is interesting to note that Tamefuji asked for “traffic …. above” indicating that at that time he placed the lights at an altitude above the 747 jet, even though when he was interviewed a month and a half later he recalled the lights being below the jet. The suggestion that the lights were a bit above agrees with the captain’s recollection. 5:19:32 AARTCC – JAL1628 heavy, roger.5:19:36 JAL1628 – Ah, roger and, ah, we [have] in sight, ah, two traffic (sic), ah, in front of us one mile about. At the time of the event Tamefuji estimated the distance to the lights as being “one mile, about” which is quite a bit greater than the “500 to 1000 feet” that Capt. Terauchi recalled in his testimony written about a month and a half later. 5:19:49 AARTCC – JAL1628, roger, do you have.., ah, can you identify the aircraft?5:19:58 JAL1628 – Ah, we are not sure, but we have traffic in sight now. 5:20:04 AARTCC – JAL1628 heavy, Roger. Maintain visual contact with your traffic and, ah, can you say the altitude of the traffic? 5:20:14 JAL1628 – Uh, almost [at] the same altitude. 5:20:21 AARTCC – JAL 1628 Roger. Would you like a higher or lower altitude? 5:20:27 JAL1628 – Ah, no, negative. JAL1628. 5:21:19 AARTCC – JAL1628 heavy, see if you are able to identify the type of aircraft, ah, and see if you can tell whether it’s military or civilian.5:21:35 JAL1628 – JAL1628. We cannot identify the type, ah, but we can see, ah, navigation lights and ah, strobe lights. 5:21:48 AARTCC – Roger, sir. Say the color of the strobe and beacon lights. 5:21:56 JAL1628 – The color is, ah, white and yellow, I think. 5:22:03 AARTCC – White and yellow. Thank you. The reference to navigation and strobe lights conflicts somewhat with the description given subsequently of multiple pulsating lights. It is unfortunate that the crew was not fluent in English (many of the words on the AARTCC tape are barely distinguishible) because, no doubt, the crew could have provided much more accurate descriptions during the sighting. I suspect that the poor description of the colors (white and yellow) was a result of the copilot not knowing the English words for the actual colors he was seeing and thereby being forced to use the closest word he knew. In the subsequent interviews with a translator the colors mentioned were yellow, amber and green. The colors yellow and amber are not conventional colors for aircraft (red, white, green are conventional) but they might be consistent with “rocket exhaust” which is what the captain compared them to in his interview and written testimony [1, 2]. PM. Note also that “back in those days” the radar operators were alert to any intrusions by Russian aircraft which might be testing our defenses. Hence the contact with the Air Force at Elmendorf. After learning the color of the strobe lights, the AARTCC began to ask about the flying conditions (“normal”) and the clouds (“below us”). It took from about 5:22:11 to 5:23:05, or about a minute, for the AARTCC to get an answer about the clouds because of interference with the radio transmissions. At 5:22:41 the AARTCC told the plane the transmissions were “garbled” and asked it to change transmitting frequencies. In his testimony the pilot recalled the several requests for cloud altitude: “They asked us several times if there were clouds near our altitude. We saw thin and spotty clouds near the mountain below us, no clouds in mid-to-upper air, and the air current was steady” . The pilot also remembered the communication problem: “The VHF communications, both in transmitting and receiving, were extremely difficult for 10 to 15 minutes while the little ships came close to us and often interefered with communication and Anchorage Center. However, communication conditions became good as soon as the ships left us. There were no abnormal- ities in the equipment of the aircraft” . When he was interviewed the captain was asked to describe the type of interference he heard. He described the interference as “some kind of,like, ah, jamming… it was just a noise, sounded like zaa, zaa” . The communications ca-pability was, he said, two out of five possible levels (5,4,3,2,1) with five being perfectly clear . Normally communications with a plane in that area would be good. 5:23:13 JAL1628 – And now the target, ah, traffic is extinguished. We cannot see it now.5:23:19 AARTCC – JAL1628 Roger. And I’m not receiving any radar replies. It was probably at this time that the “two ships” which had been quite close to the plane since 5:18 or 5:19 PM suddenly moved farther away and to the left. Looking to the left the captain could now see that “there was a pale white flat light in the direction where the ships flew away, moving in a line along with us, in the same direction and same speed and at the same altitude as we were” . About this time the AARTCC controller decided to find out if the Air Force at Elmendorf Regional Operational Control Center had anything on its radar. 5:23:35 AARTCC – (to the ROCC) Could you look approximately forty miles south of Fort Yukon? There should be [JAL1628] up there. Can you tell me [if] you see [a] primary target and its position? It took the ROCC operator about two minutes to answer the question. In the meantime significant events occurred aboard the plane and at the AARTCC. It was now about 14 1/2 minutes since Capt. Terauchi had first seen the lights traveling along with his plane, about 6 to 7 minutes since the lights had appeared abruptly in front of the plane, and only a minute or so since the “ships” quickly moved away from the jet, apparently in the direction of the “flat pale white light”  which the captain later described as like “two white fluorescent-like lights” . A drawing made several hours later indicates that the lights were horizontally oriented and spaced apart, like two long fluorescent tubes end-to-end with a large dark gap in between them. At this time in the flight he could only see the two white lights. He was not sure whether the two “ships” had become pale white lights after they moved away from the jet or if the white lights were something entirely different. (He reported that later in the flight that he could see the outline of a large shape connecting the lights. After seeing the outline the captain had the impression that the distant lights were on a very large “mothership” and that the two small “ships” had traveled to the “mothership” .) It was difficult for the other crew members to see the pale lights through the left window and they didn’t try to describe any particular orientation or shape to the lights. They did, however, agree that there were some lights at the left where the pilot indicated. Up to this time the AARTCC had not acknowledged the detection of any anomalous target on the ground radar. Terauchi recalled his feelings at the time: “We had [earlier] said we could see lights in the 10 o’clock position (i.e., about 60 degrees to the left) at the same altitude and wondered if they could see anything on their radar. The Anchorage Center replied that they could see nothing on their radar.” (See the response from the AARTCC at 5:23:19.) Copilot Tamefuji recalled that, even though the lights were now farther away, the captain decided to “search the object by the [airplane’s] radar” . Terauchi wrote , “I thought it would be impossible to find anything on an aircraft radar if a large ground radar did not show anything, but I judged the distance of the object visually and it was not very far. I set the digital weather radar distance to 20 (nautical) miles, radar angle to horizon (i.e., no depression angle). There it was on the screen. 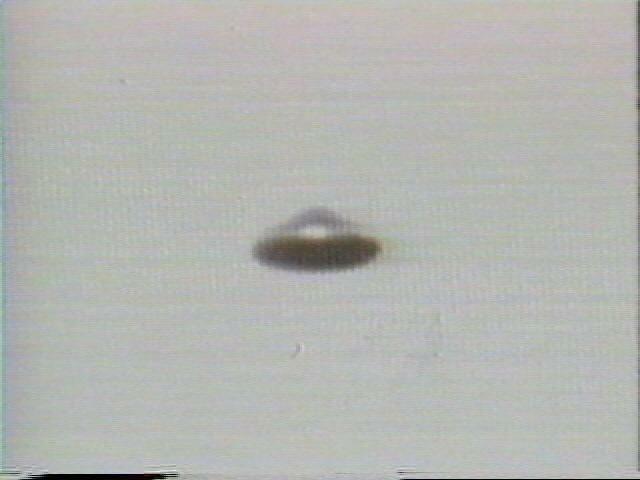 A large green and round object (here he refers to the image or “blip” on the radar screen) had appeared at 7 or 8 miles (13 km to 15 km) away, where the direction of the object was. We reported to Anchorage center that our radar caught the object within 7 or 8 miles in the 10 o’clock position. We asked them if they could catch it on ground radar but it did not seem they could catch it at all” . During the January interview Terauchi recalled that the radar detection occurred about 15 minutes after he first saw the lights, i.e., at about 5:25 PM. He was only slightly in error. 5:24:50 AARTCC – JAL1628, do you still have, uh, visual contact with the, ah, traffic?5:24:53 JAL1628 – Affirmative. Also,  we [have] radar contact, ah… (unintelligible; broken transmission). 5:25:12 JAL1628 – Ah, negative, ah, 11 o’clock, ah, eight miles, ah, same level. Over. According to Tsukuba (and also the pilot and copilot) there was no problem with internal cockpit lights reflecting off the windows since the internal lights had all been turned off (except the dim instrument lights). Tsukuba was sure that the “mothership” light was indeed outside the aircraft, but it was sufficiently indistinct and “hard to see” from his seat on the right side of the jet that he was “not certain whether it was lights of a distant town or a strange object” . He reported that the weather was clear and that none of his instruments showed any disturbances.Copilot Tamefuji recalled that the radar echo was “just like other traffic, but, ah, I thought a little bit large.” He said the radar target image was green and at a distance of 7 to 8 miles (nautical). He said he had “many experiences before in checking oncoming aircrafts on a radar” and in his opinion the radar echo was similar to a conventional aircraft echo. Several hours after the sighting the captain, who had the best view of the radar screen, drew a picture of the radar image . The sketch shows a filled circle or “dot” at the center of a thick arc that covered ten or so degrees of arc [see illustration]. The image was roughly the 60 degree to the left of straight ahead. (The radar screen was marked with circles at varying distance, 5 mi., 10 mi, 15 mi., etc., and the image of the unknown was an arc lying between the 5 and 10 mile circles.) In commenting on the radar image the captain pointed out that “normally it appears in red when an aircraft radar catches another aircraft” whereas green is usually the color of a weak weather target such as a cloud. The fact that the echo was green on the screen led him to ask whether or not the “metal used in the spaceship is different from ours” . One might also speculate on the use of radar signature reduction techniques generally calssified as “stealth.” At any rate, the shape, size and color of the radar target indicated that the object was quite large and yet quite a weak reflector. The radar target remained on the screen for an undetermined length of time, but probably for no more than several minutes. “While we were communicating with Anchorage Center,” the captain said, “the two pale white lights gradually moved to the left side and to the left diagonally back 30 degrees as if they understood our conversation and then when they were beside our aircraft (i.e., at about the 9 o’clock position or 90 degrees to the left) they totally disappeared from our radar.” This is not surprising since the weather radar as it scans back and forth does not cover an arc greater than 90 degrees to the left or right. While the “mother ship” lights were dropping back to the left and the radar echo was going off the screen of the airplane radar, the Air Force and the AARTCC were having their own radar detections. At 5:25:45, after spending two minutes looking, the ROCC radar controller reported back to the AARTCC that he was getting some “surge primary return.” By this he meant an occasional radar echo unaccompanied by a transponder signal. have transponder, such as UFOs! A transponder is a transmitter on an airplane which sends out a coded sign al in response to a radar pulse from the ground station. All commercial planes carry transponders as the main means of detection by the ground controllers. The transponder can carry more information than just the echo, such as the plane designation and its altitude. In this case the JAL1628 carried a transponder. 5:25:50 AARTCC – Negative, its not erroneous. I want you to keep a good track on there and if you pick up a [transponder signal], verify that you do not have any [military] aircraft operating in that area.5:25:57 ROCC – That is affirm(ative). We do not have anybody up there right now. Can you give me the position of the primary you’re receiving? 5:26:03 AARTCC – I’m picking up a primary approximately 50 miles southeast. But it’s right in front of the (JAL1628) . 5:26:13 ROCC – OK. I’ve got him about….5:26:15 AARTCC – Eight miles in front of the (JAL1628) he’s got traffic at the same altitude (35,000 ft.). 5:26:18 ROCC – OK. I’ve got him about his, ah, oh, it looks like about, ah, 10 o’clock at about that range, yes. The clear implication of the last ROCC comment is that the Elmendorf radar showed a primary return – an object without a transponder – in about the same location as the captain reported! (Keep this in mind as you read the FAA “explanation” presented farther on in this paper.) The AARTCC then asked the ROCC to check on any military flights in the area around the plane and ended the conversation at 5:26:35. About a minute later AARTCC called ROCC to report that the “target in front of the (JAL1628) is unknown to us” . ROCC reponded (5:27:53), “OK. We’ve lost contact with it now. The AARTCC controller then went on to say, “OK. We’re not working that aircraft (meaning the unknown target) in the… (unintelligible) ..well, the aircraft (JAL1628) still has a visual contact, only he can’t identify the [unknown] aircraft. He believes it has white and yellow strobes.” To this the ROCC controller responded (5:28:04), “OK. I’m still not, I, we lost contact on him. I don’t see him at all.” In other words, there was no longer an unknown primary return on the ROCC radar display. During this conversation the flight was continuing along a straight line heading of 215 degrees (southwestward) toward Talkeetna. The unusual lights were at the left side. The captain recalled, “When they were in front of us they were positioned slightly higher in altitude than we were, but now they placed themselves slightly below the horizon where it was difficult to see. The distance between us was still about seven to eight miles visually.” The airplane radar no longer showed a radar echo since the lights were too far to the left . Many minutes earlier, when the sighting began (about 5:10 PM), Ft. Yukon was at the right of the plane. The captain recalled the lighting conditions of the sky at the time: “When we started to see Ft. Yukon diagonally below us at the right the sun was setting down in the Southwest, painting the sky in a slightly red stripe, approximately two to three millimeters (at arms length?) and gave a bit of light but the east was still pitch dark.” A calculation of the angular elevation and azimuth of the sun shows that at the time of the intial sighting the sun was about 15 degrees below the horizon, from ground level, and was at an azimuth of about 270 degrees, or due west. This would place it below the horizon and 55 degrees to the right of straight ahead of the plane. Thus the astronomical calculation shows that the captain was incorrect in referring to the sunset direction as “southwest” although he wasn’t far off. The calculation is consistent with the claim of the captain and crew that the sun had set and that there was a thin reddish stripe of sky just at the horizon to the right of straight ahead. Under these conditions the sky to the left of the plane would have been very dark and stars would have been visible. The nearly full moon which had lighted the sky while the plane was over Greenland was now behind the plane at an azimuth of about 50 degrees and an elevation of about 10 degrees. Two planets were visible above the horizon in the southeast: Jupiter at an azimuth of about 140 degrees and an elevation of somewhat more than 11 degrees and Mars at about the same azimuth but only several degrees above the horizon. Jupiter was quite bright and Mars was much dimmer. Jupiter and Mars were 70 degrees to the left of straight ahead as the plane flew southwestward. By the time the “small ships” had moved away from the aircraft and the ROCC had detected some “surge primary return” near the jet, the sun was several more degrees below the horizon, the sky in the southeast was darker and the plane was well south of Ft. Yukon. As the plane approached Eielson and Fairbanks the captain saw :”two very bright lights” appear “suddenly from the north … perhaps four or five mountains away.” He speculated at the time what these might be. He couldn’t identify all the normal ground lights because the “flight above Alaska territory is generally in daytime and it is confusing to identify the kind of lights” on the ground. He finally decided that the lights were along the Alaska pipe line. Continuing his narrative, Capt. Terauchi recalled, “We arrived at the sky above Eielson AFB and Fairbanks.” (Actually, at this time, about 5:30 PM, the plane was about 20 miles northeast of Eielson and about 30 miles east-northeast of Fairbanks.) “The lights (of the city) were extremely bright to eyes that were used to the dark.” (The cockpit lights had been turned off to eliminate window reflections of internal lights.) “We were just above the bright city lights and we checked the pale white light behind us. Alas! There was a silhouette of a gigantic spaceship. We must run away quickly! ‘Anchorage Center. The JAL1628 is requesting a change of course to right 45 degrees.” It felt like a long time before we received permission” . Actually it took only 15 seconds to get permission, as the transcript of the AARTCC tape recording shows. But it did take longer to actually begin the turn. 5:30:16 JAL1628 – (very broken communication; unintelligible)5:30:20 AARTCC – JAL1628 heavy, you’re coming in broken. Say again. 5:30:23 JAL1628 – Request, ah, deviate, ah, ah, from, ah, object, ah, request heading two four zero. 5:30:52 AARTCC – JAL1628 heavy, you’re still broken. Say again. 5:30:56 JAL1628 – It’s, ah, very quite big, ah, plane. The radar tracking data show that by asking for a magnetic heading of 240 degrees Tamefuji was requesting a 60 degree turn to the right. At 5:31:08, about 50 seconds after Tamefuji called for permission to turn, the plane began to turn from its magnetic heading of 182(+/-1) degrees (about 215 degrees with respect to geographic north). By 5:32:08 the plane had settled on its new heading of 222 degrees magnetic (255 true), a turn of 40 degrees, which is close to the 45 degrees which the captain recalled, but less than the 60 degrees requested by Tamefuji. The captain’s narrative continues after the right turn: “We checked our rear [and] there was still the ship following us. ‘This JAL1628. Again requesting for change course 45 degrees to the right.’ We had to get away from that object. ‘JAL1628. This is Anchorage Center. We advise you, continue and take 360 degree turn.’ ‘Jal1628, thank you. We will continue 360 degree turn” . Unfortunately the captain was not totally accurate in his recall of these apparently frightening events. The AARTCC transcript shows that there was no request for a second right turn. There was, however, a request for a descent in altitude from 35,000 to 31,000 ft at 5:32:07 followed by a request to turn to a heading of “two one zero,” i.e. about a 12 degree turn to the left, at 5:34:56. Later on, at 5:36:37 the AARTCC controiller asked the plane to make a 360 degree right turn. But all of this is getting ahead of the story. So, what was it that the captain saw that caused this “flight response?” What did he mean by the “silhouette of a gigantic spaceship?” The term silhouette is applied to a situation in which the observer sees the outline of a relatively dark object against a brighter background, or vice versa. The location of the plane just before the turn was northeast of Eielson and roughly east of Fairbanks. East of Eielson there are no cities, just mountains. Looking behind and to the left, then, the pilot was looking away from city lights. This would mean that anything in the sky at an altitude somewhat below that of the plane would not be silhouetted against a bright backround. Something above the horizon, however, might have been silhouetted against a slightly bright sky since the moon (on the horizon behind the plane) brightened the sky. Perhaps what happened is that before this time the “spaceship” was below the altitude of the airplane and thus silhouetted against the dark earth (and so the captain could only see the pale white lights) but at this time the “spaceship” moved upward and was above the horizon and the captain could now see its silhouette against the sky. Alternatively, perhaps what the captain saw was a reflection of ground lights off the object and thus was able to see its outline silouetted against a dark background. Just after the plane turned to the right the AARTCC controller called the Fairbanks Approach Radar controller to find out whether or not the short range radar had a target near the JAL. The approach radar reported no target other than JAL1628. 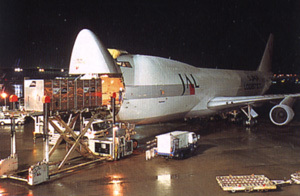 5:32:25 AARTCC – JAL1628 heavy, understand. Requesting flight level three one zero. 5:32:34 AARTCC – JAL1628 heavy, your transmissions are broken. Say again. 5:32:39 JAL1628 – Flight level three one zero. 5:32:41 AARTCC – JAL1628 heavy, descend at pilot discretion. Maintain flight level three one zero. The tracking data show that the plane descended from 35,000 ft to 31,000 ft over the next four minutes, reaching the lower altitude when the plane was almost due south of Fairbanks and just before it entered the 360 degree turn. 5:32:58 AARTCC – JAL1628 heavy, do you still have your traffic? 5:33:00 JAL1628 – Still, ah, coming, ah, ah, right in formation, in ah, formation. 5:33:07 AARTCC – JAL1628, understand. A minute and a half went by, during which time the plane flew on a straight heading whlile decreasing in altitude. Then the AARTCC decided to find out what had happened to the traffic. 5:34:38 AARTCC – JAL1628 heavy, say position of your traffic.5:34:42 JAL1628 – Affirmative. Just over Fairbanks. 5:34:52 AARTCC – JAL1628 heavy, understood. Your traffic is over Fairbanks at this time. 5:34:56 JAL1628 – Affirmative, ah, requesting heading two one zero. 5:35:02 AARTCC – JAL1628 heavy, roger. Deviations approved as necessary for traffic. This portion of the audio tape transcript shows that the captain was incorrect in recalling a second right turn. Instead, the plane turned left about 12 degrees beginning at 5:35:09 and it continued to turn as if it were heading back in the direction of Talkeetna. By the time of the left turn the altitude had decreased to about 33,000 ft. The statement at 5:34:42 that the object was “over Fairbanks” could not be correct if the object were at the left side of the plane because at that time Fairbanks was still ahead and somewhat to the right. 5:35:15 AARTCC – JAL1628, say altitude of your traffic.5:35:20 JAL1628 – Ah, oh, ah, ah, same level. 5:36.12 JAL1628 – Ah, Anchorage Center, JAL1628. Request direct to Talkeetna.5:36:18 AARTCC – JAL1628 heavy, cleared direct to Talkeetna and in, ah, advise me of your (sic) position of your traffic. 5:36:24 JAL1628 – Ah, same po… same position. 5:36:37 AARTCC – JAL1628 heavy, sir. I’m gonna request you to make a right turn three six zero degrees, 360 degree turn and advise me what your traffic does then.5:36:47 JAL1628 – Right turn 360.
looked to our right forward but did not see any light.” (Note: if an object initially behind the plane remained stationary as the plane turned to the right it would first be seen by the copilot on the right side.) “We were relieved, thinking the object may have left us and [we] returned to level flight, but when we checked to our rear the object was still there in exactly the same place” (i.e., after the turn was complete it was seen again, by the captain, far to the left rear of the plane). When the plane began the turn the AARTCC communicated with the ROCC. At 5:37:23 the ROCC confirmed that no military aircraft were “working up there” and at 5:37:30 that there was no “traffic” on the radar screen. AARTCC then called the plane again. By this time the plane had been turning for about a minute and a half. It would take several more minutes to complete the turn. 5:39:01 AARTCC – JAL1628 say again? 5:39:04 JAL1628 – It, ah, disappeared. 5:39:10 AARTCC – JAL1628 heavy, roger. At your discretion proceed directly to Talkeetna, J125 [to] Anchorage. The “mothership” was behind and to the left before the right turn. Therefore there were three possible outcomes of the turn assuming that the object didn’t just “disappear”: (a) if the object remained stationary while the plane turned it would initially “disappear” from the left side and then reappear nearly behind the plane but on the right hand side after 30 seconds to minute of turning; (b) if the object also made a right hand turn but did so on the “outside” of the airplane’s turn (i.e., at a much larger turning radius) then it would stay to the left and behind and be continually visible at the left; (c) if the object also made a right turn but trailed behind the airplane it would remain invisible during the turn. 5:38:57 AARTCC – Anchorage Center.5:38:58 ROCC – Ya, this is one dash two again. On some other equipment here we have confirmed there is a flight size of two around. One primary return only. 5:39:05 AARTCC – OK. Where is, is he following him? 5:39:07 ROCC – It looks like he is, yes. 5:39:10 AARTCC – OK. Standby. The use of the phrase “flight of two” indicated that, on the radar screen, the JAL1628 had a companion. That companion appeared as a primary return only (no transponder). 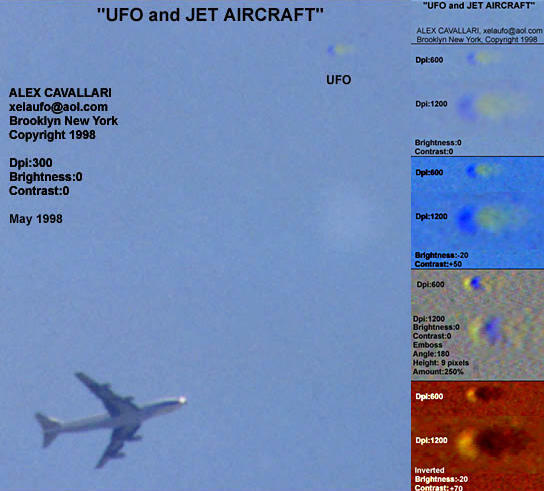 Moreover, it appeared to the ROCC that the companion was “following” that is, it was behind the plane. 5:39:35 AARTCC – JAL1628 heavy, roger sir. The military radar advises they do have a primary target in trail of you at this time. 5:39:32 JAL1628 – Ah, say again? 5:39:35 AARTCC – JAl1628 heavy. Military radar advises they are picking up intermittent primary target behind you in trail, in trail I say again. 5:39:47 JAL1628 – I think so. 5:39:24 AARTCC – OK. Do you want to, do you have anybody you can scramble up there or do you want to do that?5:39:30 ROCC – I’ll tell you what. We’re going to talk to the liaison officer about that. 5:39:33 AARTCC – OK. Uh, it’s starting to concern Japan Airline 1628, a 747. He’s making a 360 now and it’s still following…. 5:39:46 ROCC – Where is this search [radar] return at, right behind him or where? 5:39:50 AARTCC – Say again? 5:38:51 ROCC – Ah, I’m gonna talk to my other radar man here has gotta, he’s got some other equipment watching this aircraft. 5:39:54 AARTCC – OK.
5:39:55 ROCC – OK. We’re going to call the military desk on this. At this point the conversation with the ROCC ended and the plane was contacted again. 5:40:10 AARTCC – JAL1628, Anchorage Center.5:40:12 JAL1628 – Go ahead. 5:40:13 AARTCC – Roger Sir. Would you like our military to scramble on the traffic? 5:40:17 JAL1628 – Negative. Negative. Captain Terauchi’s immediate reaction to the offer of military assistance was to decline it. In his testimony he recalled the event and explained his reaction: ‘JAL1628, This is Anchorage center. Would you like to request scramble for confirmation?” The Anchorage Center, this is JAL1628.’ “We would not request scramble. We turned down the offer quickly. I knew that in the past there was a U.S. military fighter called the Mustang that had flown up high for a confirmation and a tragedy had happened to it.